Clearly a fantastic brunch as a start to Super Bowl Sunday was the right move! It's been a while since I've posted, but I'm thrilled to be back in action and look forward to sharing more eating adventures with you! Today, my boyfriend and I woke up hungry after a night of dancing. We have been cooking brunch more than we've been eating it out, but today was special since we knew we'd be making food for the Super Bowl. We trudged through the Allston/Brighton slushy streets to Deep Ellum and it was worth the walk. It was obvious from the crowd that Deep Ellum is the spot to be for brunch if you're in that neighborhood. When you walk in the spot is abuzz with good music and happy people eating delicious, creative food and drinks. We were too hungry to wait for a table and lucked out with two seats at the bar. The bartender was really nice and knowledgeable. When I go out anywhere, I like to ask the server for their advice. I'm a sucker for breakfast food, but was enticed by their lunch menu. I'll have to come back for a recommended rueben. In the end, my New York roots had me go for house cured salmon. My boyfriend got their homemade egg and chorizo sandwich. While we were waiting for the food to arrive, which was not very long, we enjoyed listening to David Bowie and watching the bar tender mix uniquely delicious looking drinks. I was surprised that they had about 22 beers on tap, but they chose to serve soda out of the bottle. They are serious about their beer! I asked if I could try their Bloody Mary mix because I wasn't ready for a drink but I'd seen the bar tender mix a few. I appreciated that they were willing to pour me a shot. That mix was perfectly spicy and pungent. Next time I go, I'll have a bloody! The food arrived and it looked bright and as perfect as it tasted. I was excited to see my salmon thickly sliced with fresh tomatoes and arugala. The color and freshness is usually saved for summer tomato season. The nova was served on a bagel with caper cream cheese closed faced. I was excited to see that there was enough nova to turn this bagel sandwich into two open faced bagel sandwiches. I love nova open faced because I get to spread out the experience of eating one of my favorite comfort foods. 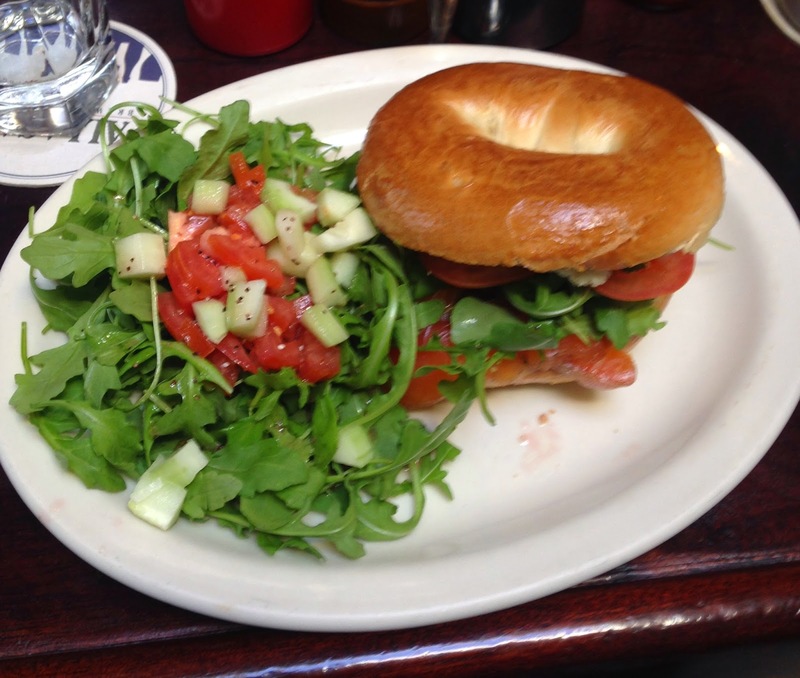 The cream cheese was a perfect addition to the fresh nova, bagel and tomato. I liked that the capers were mixed in so that they didn't have the chance of rolling off the top of the sandwich. When I finished the sandwich, I was sad because it was so tasty. While the bagel did not taste like it was from New York (a little too soft), the toppings were so good, that it could have been on a saltine and I would have wanted more. I appreciated the flexibility to give me a side salad instead of potatoes. The salad was fresh and excellent: cukes, tomatoes and arugula with some lemon and salt. I was lucky enough to also get to try my dining partner's chorizo sandwich. The egg was perfectly fried and had quite a bit of pepper on it. 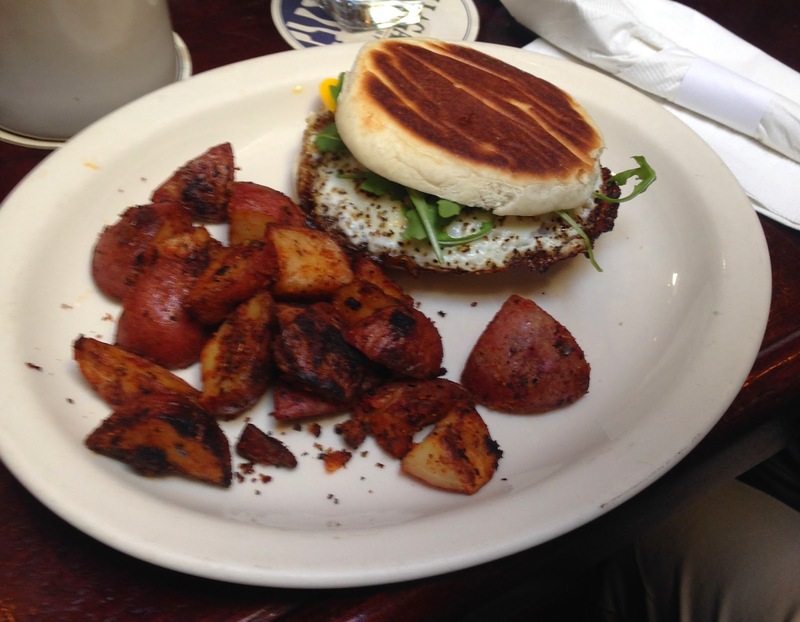 It was served on a homemade English muffin and the house chorizo was sliced and crisped perfectly. I was not expecting the homemade English muffin but it made the sandwich that much better. The crunch of the chorizo paired with the homemade English muffin and perfectly cooked egg made my bite absolute perfection. Not only was the food outstanding, but it was reasonably priced ($25 including tax and tip) and the atmosphere was relaxed and friendly. I will go back to Deep Ellum in a heart beat. Looking forward to having lunch, dinner and drinks! When I do go back for brunch, it will be hard to decide if I will try something new or have that nova that tugs on my nostalgic New York heartstrings.